2016 was an extraordinary year for Floating Bench and our new collaboration with Sitting Spiritually. The bench and its new partner, the Yakisugi swing seat which form the basis of the Simon Thomas Pirie Contemporary Range had their first outing at RHS Chelsea, with Yakisugi ending up as a feature in the Raymond Blanc hospitality area – Le Jardin Blanc. Meanwhile Floating Bench was shortlisted for the RHS Chelsea Garden Product of the Year award and was part of two RHS Gold Medal winning gardens at the Hampton Court and Tatton Park shows. All this generated lots of magazine, TV, and social media coverage and a healthy order book! 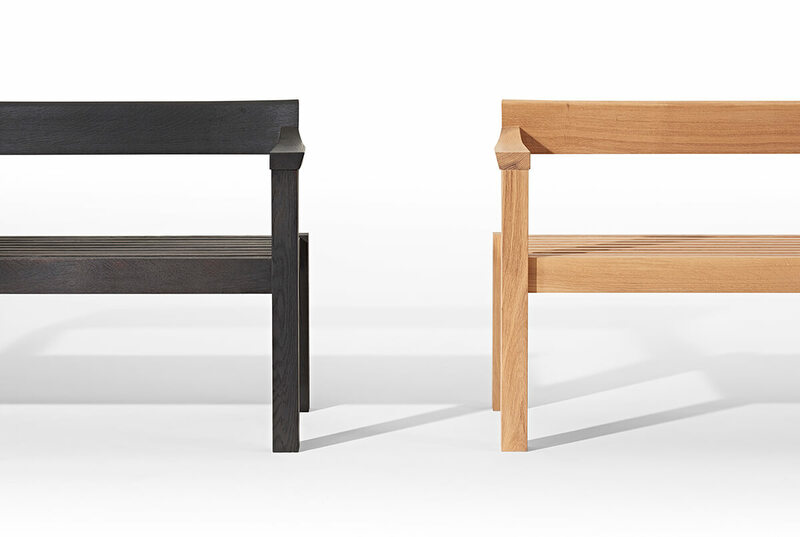 The Blonde is finished in natural oak with no scorching at all – pure and simple, exquistitly finished and detailed. In a way we are saying ‘”we’ve done the scorching thing and moved on”. But that’s not entirely true, because we still love that texture and character that the burnt surface gives us. It’s a black like no other black, somehow deeper and more ephemeral; so we decided to create the ‘Noir’. This completely scorched Floating Bench has real presence, it’s a piece of sculpture as well as humble garden seating. As a statement this is saying “we are taking scorching to its visual and technical limits!” The result is a jaw-dropping piece of refined beauty, but with a real edginess. Burning timber to create a scorched surface is relatively easy, but creating that depth of finish, the texture and the stable surface has taken us many years to perfect. Actually it’s far from easy as the harshness of the flame shrinks the timber and creates an unstable brittle surface. We have to work hard though various processes to turn it back into a hard-wearing surface finish, but the end result is worth it. Playing the Blonde and Noir special edition benches off one another was fun in the photoshoot. We have always loved exploring what you can do by creating opposites. It’s an approach that we have regularly taken with our furniture over the years. Experience has taught us that a single design made in different timbers can take on very different personalities. Lighter timbers like sycamore or ash tend to produce more delicate, soft and sensitive, almost feminine characteristics; whilst darker timbers, walnuts, or burrs for example tend to demand more attention and make excellent statement pieces. 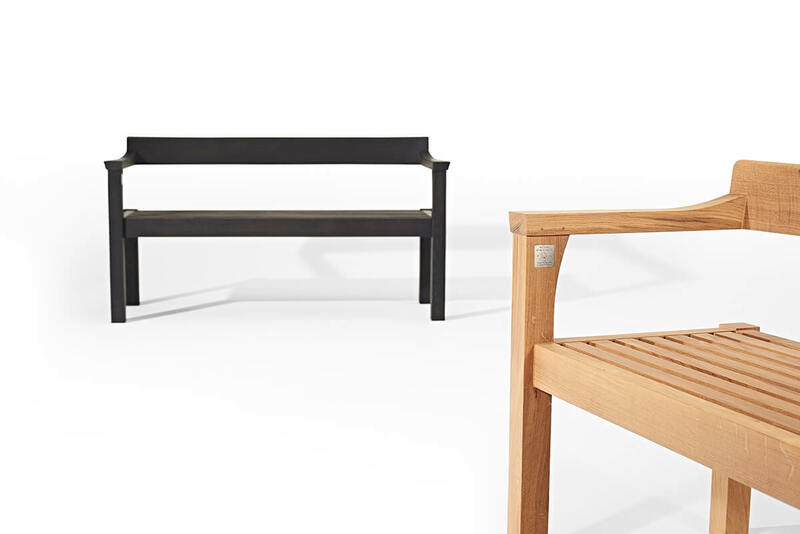 The contrast between the natural mid tone oak and scorched variant on this bench do indeed create two very different beasts which just goes to highlight what you can do with a single product. Of course we shouldn’t forget the original two-tone Floating Bench here. It is still likely to be the best seller with that lovely balance between the two extremes of timber, texture and contrast. 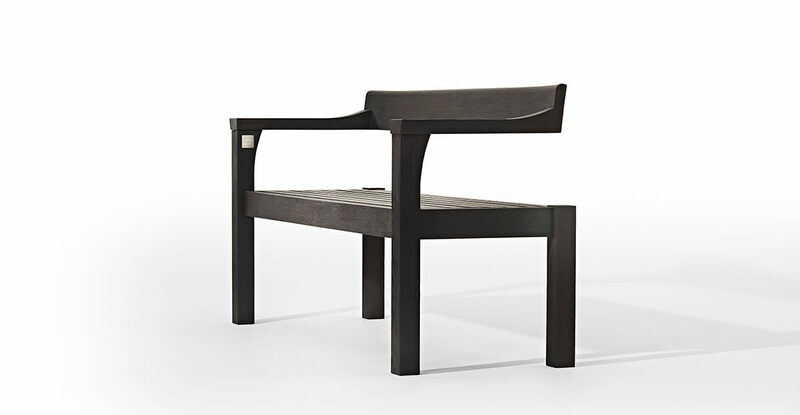 During the early development of the Floating Bench we did come across a few clients for whom the scorched surface was too stark or contemporary, so these clients were the impetus for the Blonde. If the client for a Blonde is shying away from the contemporary, then the client drawn to Noir is positively embracing it. It’s a bold statement piece that will hold its own in a highly landscaped garden, or as a foil to some very specific foliage or planting. I can also see Noir as an inside piece, holding its own within a strong architectural interior. We think these new additions to the Sitting Spiritually ‘Simon Thomas Pirie Contemporary Range’ will make 2017 as exciting as the 2016 launch year, broadening the client base and interest. Floating Bench has been shortlisted for 2 more very high profile awards this year. The first is for a B&LLA (Brand & Lifestyle Licensing Awards) as it now a Sitting Spiritually licensed product for Royal Horticultural Society. It is the RHS that suggested we all entered the bench for this award. 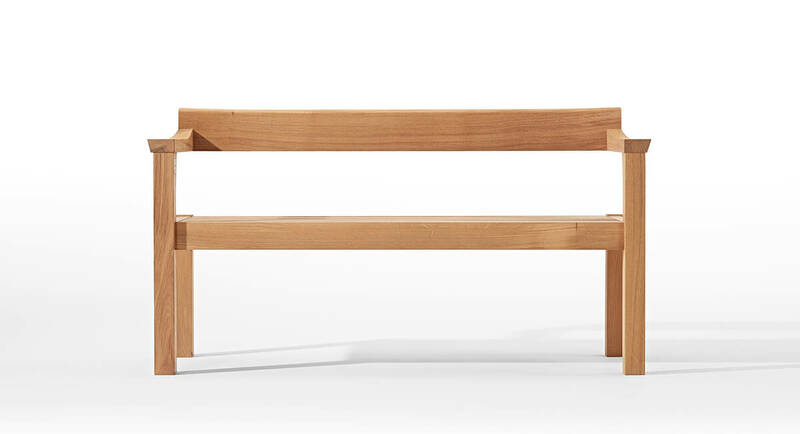 Even more excitingly from a design perspective Floating Bench has been shortlisted for a prestigious Design Guild Mark from the Worshipful Company of Furniture Makers. Both these awards will be announced in late April, just in time for RHS Chelsea. Fingers crossed on both hands! Both Blonde and Noir Special edition Floating Benches will be on the Sitting Spiritually Ltd of Lyme Regis stand at the RHS Chelsea Flower Show 23rd – 27th May 2017 (Stand RHW295). You might may be able to get a pre-Chelsea sneak peak of the range at the Sitting Spiritually Open Garden Weekend, which takes place at their Lyme Regis HQ on the weekend of 29/30 April. For more information visit the Sitting Spiritually events page here. 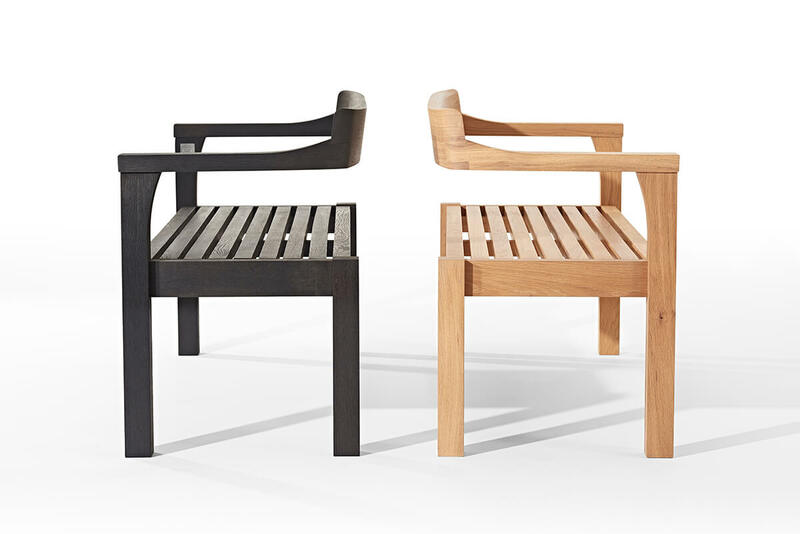 The ‘Simon Thomas Pirie Contemporary Range’ of garden furniture is available exclusively through Sitting Spiritually. The images above are all of 2 seater versions of the bench, there is also a generous 3 seat version available in all finishes. 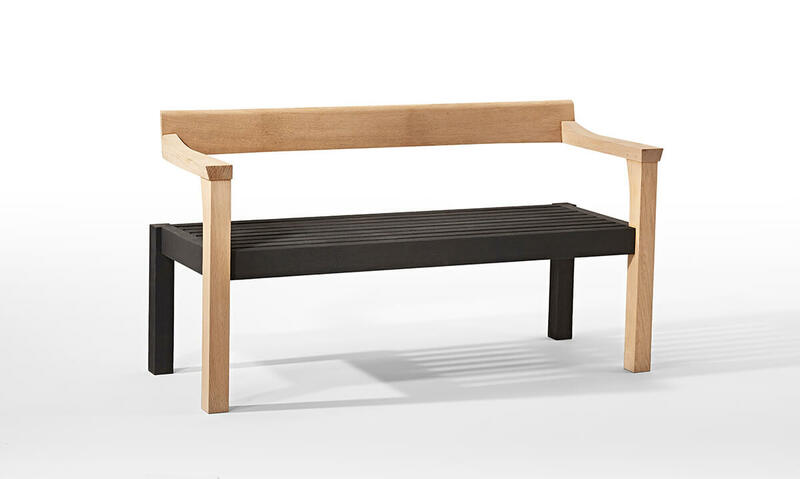 For more details and pricing of all Floating Benches and Yakisugi swing seats visit the website by clicking here. All Images taken by Double Exposure Photographic.